Altar Servers assist the priest at Mass. They assist at the weekend Masses, weddings, funerals, and special liturgical celebrations throughout the year. They have the great privilege of kneeling so close to the altar as our Savior, Jesus Christ, becomes truly present, Body, Blood, Soul, and Divinity on the Altar. The altar server performs an important role in maintaining the sacredness and dignity of the Mass through their example. The altar server must know the prayers of the Mass, make the proper responses, and maintain the proper respect required. Service at the Altar of the Lord requires a proper disposition and a desire to serve the Lord in a special way. Altar servers are encouraged to reflect upon their call to serve God’s Church in this service, to grow in personal holiness, and to examine the possibility of serving the Lord in the priesthood or religious life. 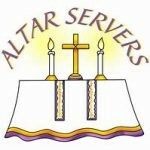 All boys and girls in the 4th, 5th, and 6th grade are welcome and encouraged to participate in training to become an Altar Server. Our Altar Servers are able to serve through high school if they so choose. Those who wish to serve must be in the parish grade school, private school, or in our P.R.E.P. program. Candidates go through a period of training before they are commissioned to serve at Mass. Interested candidates are encouraged to contact the Parish Office at 215.343.0315 or strobertsecretary@verizon.net.